1 How to Check my Daily Target to get Banglalink 100% Bonus Offer 2017? Banglalink Daily 100% Bonus On Target Usage Offer 2017. All the Banglalink prepaid subscribers (except ev, sme, corporate and pco)are eligible to enjoy Banglalink daily usage target based 100% bonus Offer. How to Check my Daily Target to get Banglalink 100% Bonus Offer 2017? To check your Daily Target, just Dial USSD Code *121*12#. After knowing the Daily Target, customers need to fulfill the Target to enjoy this BL Daily 100 % Bonus On Target Usage Offer. To activate Banglalink daily usage target based 100% bonus Offer 2017, customers need to Dial USSD code *166*36#. Every day upon achieving the target, User will get 100% bonus instantly. 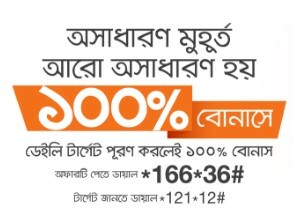 Customers can use this BL 100% Bonus during the next day, and bonus Taka can be used for banglalink to banglalink calls or internet (pay-as-you-go). FNF calls are not applicable. To check BL Daily 100 % Bonus On Target Usage Offer 2017 bonus balance, just Dial *124*20#. The Banglalink customers are eligible to enjoy Banglalink 100 % Bonus Offer 2017 On Everyday Target Usage only one time in a day. This Banglalink BL 100% Bonus Free Offer is limited time offer. Thanks for staying with us a long time and visiting Banglalink Daily 100% Bonus On Target Usage Offer 2017. If you have any confusion or question about the Banglalink 100%Bonus Offer, Just comment here. We reply as soon as possible with a correct answer.